The Bay and the farm: Those are the life forces of Chesapeake Country. Weve played in the Bay all summer. Now, when cornfields fade to brown and nights become crisp, its time to find your fall fun at the farm. If youve always thought of farm life as all work and no play, then youve not yet hopped on a new bandwagon  make that hay wagon  rolling through Chesapeake Country. Many farms hereabouts share with you the rewards they reap from their hard, year-long work. Baskets of apples, field-grown mums, pumpkin patches, corn mazes, and hayrides all spill from autumns cornucopia. Local farms give you as many choices as the changing leaves have colors. What makes farms so attractive to visit during the fall? Maybe youve never visited a working farm, or maybe you want your kids to see whos growing the food you eat. Perhaps you feel the romance of the harvest  the bright golden colors, the sense of coming home or the chance to spend time outside before winter sets in. By making farms attractive to you, help support themselves. Hill High Farm in Virginias Shenandoah Valley generates 50 percent of its income in two months of the fall season, family farmer Wendy Wright reported at an agritourism seminar this summer sponsored by the Southern Maryland Agricultural Development Commission. In the new century, more and more farms are seizing agritourism to help them continue a way of life thats fast disapparing. Forced off the land by rising costs, falling prices and large-scale competion, farmers have been reduced to less than two percent of the national population. Marylands farmlands continue to shrink, comprising only two million acres in the most recent agricultural census in 2002, compared with five million in 1910. For all those reasons, our remaining farmland is each year sprouting more pumpkin patches. We definitely have more farms coming on board, says Schulz. Farmers are looking for an alternative way to increase their income. Their need sets agritourisms hay wagon rolling. While working to support themselves and their farms, these farmers also get to enjoy with their customers the essence of autumn. Here are just a few of the many agritour farms that are rolling out their welcoming mats for you. In Davidsonville, a large hay-bale spider beckons you to the farms bounty. We have a pick-your-own pumpkin patch, a just-picked pumpkin patch, a corn maze, hay rides, a farm animal petting area, corn box a sand box filled with corn kernels gourds, Indian corn, corn stalks, potted mums, straw bales and pedal tractors for kids, says Cindy Greenwell, owner of Knightongale Farm. She works the pumpkin patch along with her husband and four children. It is so fun; The kids love it, she says. Even so, these fruits of fall come from hard work tending the land the other three seasons. Its a 90-acre working farm; we bring hay and corn off every year, Greenwell says. Also each year, Greenwell says, they add more fall-themed activities and products to their autumn offerings. Greenwell got into the agritourism business with mums. Im a flower person. I raise 5,000 mums each year, she says. 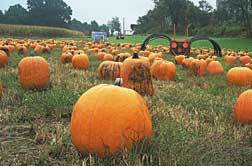 Now, with agritourism, Greenwell is hoping for a bumper crop of fall visitors. Not too long ago, Doepkens Farm in Gambrills used to grow just tobacco, but then they couldnt get enough help to work the fields. Nowadays at Doepkens Farm youll find mums, and lots of them. Marjorie Doepkens and her son William have sold chrysanthemums for nearly 12 years. Besides more than 95 different varieties of mum, she also has cornstalks, fresh and dried flowers and gourds and pumpkins, some that weigh upward of 100 pounds. Each year the Doepkens grow a giant mural made of living mums that has been featured on Channel 4 News. Planted on Memorial Day, the murals range from sunbursts to roosters. You can taste a bit of farm life right in Annapolis, too. The third annual pumpkin patch run by The Friends of the Lighthouse Shelter brings fall festivities to St. Martins Lutheran Church. As families enjoy the fall festivities, the three-week event raises money for area homeless shelters. We sell everything from little mini-pumpkins, spookies, to 20-pound pumpkins. Well also have gourds, a new cookbook, pumpkin soup, breads, baked goods and decorative pieces, says Craven Engels, publicist for Friends of Lighthouse Shelter. Games and storytelling also help families to share in the spirit of autumn. These pumpkins themselves have stories to tell: They come from Native American tribes in Arizona, which raise millions of pumpkins every year to sell for church fundraisers such as Lighthouses. Volunteers from 17 area churches run the pumpkin patch for The Friends of the Lighthouse Shelter of Annapolis Area Ministries. All proceeds support the Lighthouse and Anchor House homeless facilities in Annapolis. Their first job is unloading their truck full of Native American pumpkins, next is helping you to find the one thats just right for you. Travel farther north and youll discover Pumphreys Farm in Millersville, which has been producing for 43 years. The brothers who own the farm used to make their profit on vegetables and some tobacco. A little extra land one year sparked the idea of growing pumpkins. Theyve found the sales of pumpkins, which in 1972 started at $3 for all you can carry in your arms, is really a good deal for everybody, says Nat Pumphrey. Todays all-you-can-carry price is $15. The brothers farm also sells single pumpkins and features a pick-your-own pumpkin patch in addition to the all-you-can-carry selection. Their pumpkins range from 150-pound Prizewinners, a big hybrid, to smaller pumpkins for jack olanterns and tiny miniatures. People come back year after year for pumpkins, says Robert Pumphrey. In addition to their pumpkins, Pumphreys Farm also boasts apples, cider, watermelon, corn and mums. Kids can even find their way through a sunflower maze. If its a farm adventure youre after, head into a premier corn maze laid out just below the early 19th century manor house at Billingsley House in Upper Marlboro. Formerly a tobacco farm, the land now yields corn and beans as well as attracting a new crop of tourists. By autumn, most field corn is yellow and dry with knife-edged leaves. Billingsleys maze of a field had to be planted late, in July, for a greener, more comfortable maze. In the corn, paths have been cleared in the shape of a rockfish. The rockfish not only fit the six-acre field space below Billingsley House, operated as a historic farm by Maryland-National Capital County Park and Planning: Its Marylands state fish, says Mary Haley-Amen, director of Patuxent River Historic Sites. Youll start at the mouth of this rockfish, finding your way from head to tail with a map, before ending where you began, at the mouth. After you find your way around the maze, you can continue your fall festivities with hayrides and a tour of the farm museum, located in a cherry-red barn. The brand-new maze was conceived as a fundraiser, to benefit the historical house and property. Bringing you to the Billingsley farm will bring you to Billingsley House, and all its history, too. Nows the best time for a farm excursion. As well as the main event, youre bound to find surprises of all kinds: friendly pets, chickens, colorful arrangements or bright red tractors. Now that many farms are inviting visitors, dont be surprised if you find yourself taking a little piece of farming home with you this autumn. Check out the Department of Agriculture at www.mda.state.md.us for more Fall Farm Fun around Maryland. Oct. 9-31Buy pumpkins, gourds, pumpkin soup and fall decorations; then enjoy the fall festival of games, storytelling, bake sale and more. All proceeds benefit Lighthouse and Anchor homeless shelters in Annapolis. 10am-dusk @ St. Martins Lutheran Church, corner of Hilltop and Spa Rd. Annapolis: 410-263-4723. Thru Oct. 30At Doepkens Farms Fall Chrysanthemum Season, youll find their giant mum mural bloom as each type opens. Youll also find pumpkins, gourds, straw, corn stalks, Indian corn, dried flowers and fresh-cut flowers. Tu-Su 10am-6pm @ Doepkens Farm, 2657 Davidsonville Rd., (just past Rt. 50 exit), Gambrills: 410-721-2739. Thru Oct. 31Fruits of autumn abound with pumpkin patches, a smaller corn maze, hay rides, a corn box, gourds, Indian corn, corn stalks, potted mums, straw bales and peddle tractors. 10am-5pm SaSu @ Knightongale Farm, corner of Rt. 2 and Birdsville Rd., Davidsonville: 443-871-1073. Thru Oct. 31Walking through this corn maze may feel a bit fishy: its actually cut in the shape of a rockfish. Fall into autumn with a hayride and a tour through the farm museum. 10am-5pm SaSu @ Billingsley House Museum, Upper Marlboro; call for directions; $5: 301-627-0730. Thru Oct. 31Pick-your-own pumpkin or gather as many as you can carry. Brave the sunflower maze and complete your farm visit with some fresh autumn produce. 9am-7pm @ Pumphreys Home Grown Vegetables, 8220 Veterans Hwy., just south of Old Mill Rd., Millersville: 410-987-4290.